As a designer, I’m always stumbling upon different websites and resources online that offer photos and various elements that help me in my daily work. Some of these sites are free and/or nominal cost. It was about a year ago that I happened upon the Library of Congress’ Prints & Photographs Online Catalog while doing some research for photos. What a treasure trove of images! I discovered old Civil War photos, WPA posters, pictures of Abraham Lincoln and classic photos of Minnesota (where I live). There’s a wonderful website called Shorpy that posts old photos everyday submitted from readers to the site as well as photos they have obtained from the Library of Congress (LOC). They will get these photos, check the rights and then clean ’em up and offer prints of the photos for sale. They usually feature some pretty interesting photos (another time waster!). There are many nuances to copyright law and I won’t get into that (nor do I have the expertise to do so). But the brief idea is that images produced before 1923 are in the public domain and are ‘free to use’. Items published between 1923 and 1963 with the attached “©” symbol have rights reserved for 28 years and could be renewed for another 67 years after. If they were not renewed – they’d be in the public domain and free to use (but they had to have that copyright mark). Items published from 1964 to 1977 with the “©” symbol were protected for the 28 years and were automatically renewed for another 67 years. When work is fixed in tangible medium of expression – notice is irrelevant – copyright protecion lasts for the life of author and 70 years based on the the longest living author if jointly created or if work of corporate authorship, works for hire, or anonymous and pseudonymous works, the shorter of 95 years from publication, or 120 years from creation. All this to say – a lot of the images pre-1923 on the LOC’s prints/photographs site are free for the taking (except for any reserved rights of course). This is pretty cool for a designer like me. 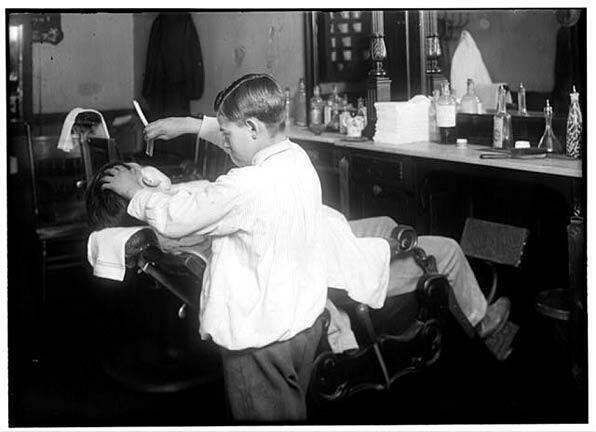 Let’s say you want to decorate your basement den in old barbershop images (that photograph above is of a 12-year old barber working in his father’s shop!). Do a search at the LOC’s website and you’ll get results of various photos from different decades. If you find an intriguing photo – check for the date of the image – and if before 1923, you should be free and clear to use and print. The great thing about the catalog at the LOC site is they house large resolution copies of the images. If you find one to your liking, you’ll want the large resolution file for printing (generally larger than 1MB). These will produce the best quality photographs. After you have downloaded some photos you like – you can load them to a CD or send directly to Walmart Photo (my personal favorite because they’re affordable and have an easy-to-use site). Set the size you want and print away! Most of the sizes that Walmart offers fit ready-made frames. You could even pick-up an inexpensive frame while at the store (or one that isn’t in use at home) and you’re in business! I’m a sucker for antique-looking stuff – so I love the look of older photographs decorating the home. And, you’re not out an arm-and-a-leg in decorating costs. How do you decorate your house on the cheap? UPDATED 1/6/16: The New York Public Library just released a bunch of high-resolution images into the public domain, available for reprint and use. Have fun exploring! Does it Matter Which Furnace Filter I Buy?